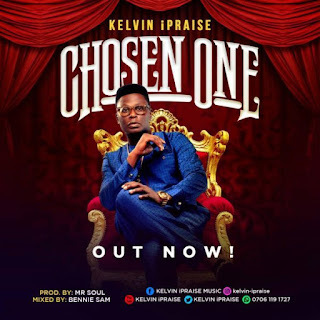 Kelvin iPraise has finally released his much anticipated single titled ‘Chosen One’. The legendary lyrics of the song has indefinite appeal to the new creation ‘Man’ who has been called out of darkness into God’s breathtaking light. At a time like this when uncertainty looms and drought of hope is pervasive, ‘Chosen One‘ comes handy, not only as a reminder of the believers existential privilege, but a true and unbiased confession of faith. Darlinton Unuagba also known as Kelvin iPraise could be referred to as a man of many colours , but the hue of music passion takes the centre stage in the life of this young man, indefatigable Niger/Delta born music talent. A graduate of Computer science and an entrepreneur kelvin’s life delineate the theme of the song as a man chosen to show forth the marvellous light of God in his endeavours. He believes grace would attend to your needs as you listen to this song which harps of scriptural fact of who you really are in Christ Jesus. The song was produced by Mr. Soul Official.